Comets, like asteroids, are small celestial bodies that orbit the Sun. However, unlike asteroids, comets are composed primarily of frozen ammonia, methane or water, and contain only small amounts of rocky material. As a result of this composition comets have been given the nickname of "dirty snowballs." Some comets have highly elliptical orbits that bring them relatively close to the Sun. As these comets near the Sun the ices found within them melt and brilliant features are formed. Below is a list of these features. Nucleus: the nucleus of a comet is composed of ice and rocky material. The nucleus of most comets ranges from about 10 to 100 km in diameter, though they can be as large as 100 km in diameter. Coma: the cloud of gases that forms around the nucleus as the coma is heated is know as the coma. These gases are usually a mixture of water vapor, ammonia, carbon dioxide. Dust Tail: the dust tail of a comet is composed of gases and tiny dust particles blown away from the nucelus as the comet is heated. The dust tail is the most visible part of a comet. Ion Tail: the ion tail is a stream of ionized gases that are blown directly away from the Sun as a result of the comet’s contact with the solar wind. Comets have been seen by humankind for millenia. However, scientists have determined that given the “shedding” of material each time a comet orbits closely to the Sun, a comet’s lifespan may only be thousands of years – relatively small number when compared to the lifespan of the Solar System. Thus scientists have concluded that if comets are still present in the Solar System today, then there must be a nursery of comets somewhere in the Solar System, otherwise all of the comets would have run the course of their lives long ago. Furthermore, since we have determined almost all of the inner Solar System objects the only place left for this reservoir of new comets to exist is in the outer Solar System. Over the course of the second half of the twentieth century evidence provided by the orbits of comets suggested that there is not just one region of the outer Solar System producing comets, but two. The first of these regions is what is known as the Kuiper Belt, a band of comets similar in many ways to the Asteroid Belt found in the inner Solar System. Comets originating in this region have relatively short orbital periods and orbit the Sun in roughly the same plane as do the planets. The second region, called the Oort Cloud, is a region farther out than the Kuiper Belt and is essentially a spherical shell. Those comets coming from this area have orbital periods much longer than those of the Kuiper Belt. Additionally, the orbital plane of comets from the Oort Cloud may be drastically inclined to that of the orbital plane of the planets. As for how a comet originating in one of these regions acquires an orbit that brings it into the inner Solar System, current theories propose that it may either be knocked into its new orbit through a collisions with another comet or its orbit may be altered by the gravitational force of an interstellar object passing nearby in the outer Solar System. There are several famous comets, with some being known to ancient humans and some only recently appearing. Below are the most well known comets. Halley’s Comet. In 1705, while studying the orbits of several known comets, Edmond Halley found that the comet observed in 1531, 1607 and 1682 was one in the same. As a result of Halley’s discovery, the comet was named after him. Halley’s Comet is visible every 75 to 76 years. Comet Hale-Bopp. Comet Hale-Bopp is best known to most people for the much publicized Californian cult who believed the comet to be a spacecraft. Comet Hale-Bopp was last visible in 1997 and will not be visible again for approximately 2,300 years. It is named after its co-discoverers, Alan Hale and Thomas Bopp. Comet Shoemaker-Levy 9. Shoemaker-Levy 9, also known as SL 9, was a string of comets that was captured by the gravity of Jupiter and subsequently began an orbit about the planet. The orbit of SL 9 assumed about Jupiter was, however, highly irregular and as a result of this irregularity SL 9 crashed into Jupiter in a brilliant display during the week of July 16, 1994. Shoemake-Levy 9 is named after its discoverers, Gene Shoemaker, Carolyon Shoemaker and David Levy. Sometimes comets are referred to as “dirty snowballs” or “cosmic snowballs”. This is because they are composed mostly of ice, rock, gas and dust. Comets orbit the Sun in elliptical paths – just like the planets. The path of a comet though is far more elliptical than that of any planet. A comet has four components: a nucleus, a coma, a dust tail and an ion tail. The nucleus of a comet contains the vast majority of its total mass. 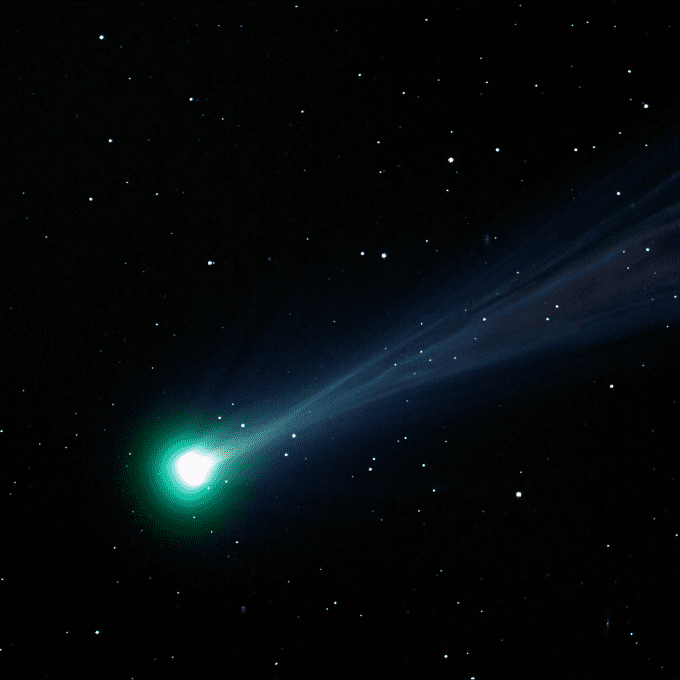 Comets have a halo when they move close to the Sun. What happens is the solar radiation vaporizes the ice and gas gas in the comet into a halo around it. The halo is known as the comets coma. The ion tail of a comet is the result of solar winds that blow the gas particles directly away from the Sun. A comet’s dust tail is a trail of dust and rocky material that is left behind as it moves along its orbit path. Comets are believed to originate in one of two regions – the theorized Oort Cloud, or the Kuiper Belt found beyond the orbit of Neptune and the dwarf planet Pluto. The Oort cloud is an outer region of the Solar System 50,000-150,00 times the distance from the Sun to Earth that is believed to contain dormant comets. Some of the comets that originate here have orbits lasting millions of years. The Kuiper Belt is ring of dormant comets located just beyond the orbit of Neptune. The comets originating here have orbits lasting hundreds of years or fewer. The most famous comet is Halley’s Comet. It has been observed since at least 240 B.C. Its orbit makes it visible from Earth every 76 years. It was named after the British astronomer Edmond Halley. Notable comets include Comet Hale-Bopp, which was discovered in 1995 and Comet Hyakutake, discovered in 1996. There are over 3,000 currently known comets. Scientists believe that there be up to one billion comets in our solar system. A great comet is one which is bright enough to be visible from Earth without the need for a telescope. Approximately one great comet happens every ten years.